Families of the Chinese passengers on the missing Malaysia Airlines flight MH370 have threatened a hunger strike if the Malaysian authorities fail to provide more accurate information. 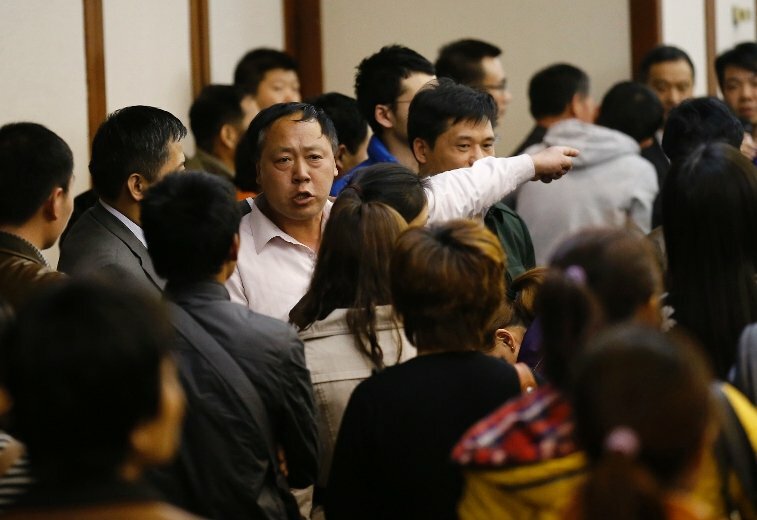 Relatives vented their anger at a meeting with the airline in Beijing. Officials in Malaysia say they are trying to narrow the search area, which now covers about 2.24 million square nautical miles (7.68 million sq km). Flight MH370 went missing on March 8 with 239 people on board. Some 25 countries are involved in looking for the plane. A total of 153 Chinese nationals were on board the missing aircraft, which was flying from Kuala Lumpur to Beijing. China’s state media has been criticizing the Malaysian operation. Some Chinese relatives have said they believe the Malaysian authorities are holding information back and have demanded more clarity. After a meeting with officials from Malaysia Airlines on Tuesday, families held a vote on organizing a hunger strike. Ahmad Jauhari Yahy, chief executive of Malaysia Airlines, told a news conference on Monday that the airline was doing everything it could for the families. Captain Zaharie Ahmad Shah was a supporter of the jailed politician. Hishammuddin Hussein praised the international response to the search efforts and said teams were continuing to search two vast air corridors north and south of the plane’s last known location. He added that the Malaysian authorities still believed the disappearance was a result of “deliberate action” on the plane. Malaysia says the plane was intentionally diverted and could have flown on either a northern or southern arc from its last known position in the Malacca Straits. China said earlier it had started searching its territory for the aircraft. The Chinese ambassador to Malaysia, Huang Huikang, also said background checks had shown no evidence to suggest any of the Chinese passengers had terror links, Xinhua news agency reported. China said it had also deployed 21 satellites to help with the search. Thailand’s air force said on Tuesday a re-examination of its radar data found what may have been the plane travelling west towards the Straits of Malacca shortly after it lost contact with air traffic controllers. The Thai military had previously said it had not detected any sign of the aircraft. The Malaysia Airlines plane left Kuala Lumpur at 00:40 local time on March 8. The last transmission from the plane’s Aircraft and Communications Addressing and Reporting System (ACARS) was received at 01:07.